What a ride it has been since Allergic to Life: My Battle for Survival, Courage, and Hope debuted last year. I have been fortunate to have had my first blog tour with some of my amazing followers as well as through Rave Reviews Book Club. It was amazing being spotlighted with both PNP Authors and Rave Reviews Book Club. 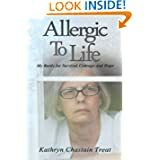 Allergic to Life has received some wonderful reviews and exposure as well. This past October I celebrated in a BIG way by having a book launch party at the home of my dear friends Steve and Victoria. A friend and classmate Jerri Hansen, author of Fences and My Life on the other side of the Tracks, surprised me with a book trailer she had made for me. I also had a book trailer made from Nonnie Jules, author of Daydream’s Daughter, Nightmare’s Friend and the Good Mommie’s Guide and owner of 4WillsPublishing, that features music made specifically for the trailer. Pattimari Cacciolfi, author of Sometimes our Greatest Misery is our Greatest Happiness and Stolen Identity, of PNP Authors made a book trailer introducing me and Allergic to Life. To celebrate this amazing year and all the wonderful people I have met, I am giving away three signed copies of Allergic to Life (US Only) on Goodreads. I am sorry that I can’t do signed copies for those of you outside the US. I am going to also give away three e-book copies to anyone outside the US. To receive an e-book copy, simply leave a comment below on why you would like to receive a copy. The contest will run from August 30, 2014 through October 30, 2014. I appreciate the support all of you have given me not only on this blog but with my book as well. You are all so very wonderful!